It’s week 6 of this year’s Project 52. After last week’s frantic working week, this has been much calmer. Sunday was a quiet one. Just playing games, doing jigsaws, We’ve done pretty much nothing at weekends since the Christmas holidays. I’m really not enthusiastic about going out in miserable cold weather, and we never seem to have a decent few hours to actually do anything. The week has been uneventful apart from parking stress at work. We’re back to fighting over our allocated number of spaces, because another company has moved into the office building and claimed 15 spaces of the ‘free for all ‘ ones. It means that by 8.20, there’s no spaces left unless you’ve been able to book one. So we’re back to scrabbling for the few free areas of parking or paying in the car park round the corner. School did have 2 internet safety sessions this week. N wasn’t impressed, saying it was boring. Although he did take in about cyber bullying so he did take in some of it. On Friday N was awarded Learner of the Week. He forgot to tell us, so I found out in the weekly newsletter. It was for maths and good understanding of area and perimeter which they’ve been doing this week. His homework over the last couple of weeks has really showed how well he’s understanding things in maths, reading comprehension and researching facts. His handwriting is really good – although he’s a few letters that he argues that his incorrect way of forming them is actually correct. I need to chat to his teacher to find out if they’re correcting him or whether they’re ok for him to do what he does – it mostly works out fine, but is lazy. I don’t want him to miss out getting his pen licence if he has to format everything correctly. Saturday N had a really good swimming lesson again. They’re putting together breaststroke arms with the legs and breathing now. When I was a child we were just told to get in the pool and do the stroke. So it’s interesting to see how they teach it now: starting doing 3 leg kicks to 1 arm pull and breath, then reducing it to 2 leg kicks and then 1. With only 4 in the lesson the teacher sent them off individually to give them feedback. I don’t think their class will stay at the normal 5 kids because the other teacher’s level 4 class were doing test distance swims today, so I have a feeling they want to move some up to reduce the size of their class. That teacher isn’t as technical and strict so there’s a big gap between N’s old level 4 stage ability and that group, so could be a big leap up for any of them moving up. Before swimming I’d had to get the OH a new mobile because after it was smashed and a bit variable over the last 2 months, he managed to have someone drive the pick up over it so it wouldn’t turn on. It’s always a nightmare because it was set up by his mum, in the OH’s name, and I was down as an authoriser because the OH won’t sort out his own. I ended up having to cancel the old account, and reset a new contract up under my account, and in 30 days time I’ll have to try and get that number transferred fully to him along with the direct debit. I did get him a better deal again though which is good. Hopefully doing it that way means I can get rid of having to fix things with it myself. The photo I’ve chosen for this week is of N’s latest Lego creation. It’s a mobile police bike station ‘van’. He’s done quite a lot of Lego building this week, not of his technic lego sets, but his own creative side. I don’t like going out in the cold either! I can understand the pain to go out during winter and Well done to N for getting learner of the week! It sounds like he’s doing really well at school. 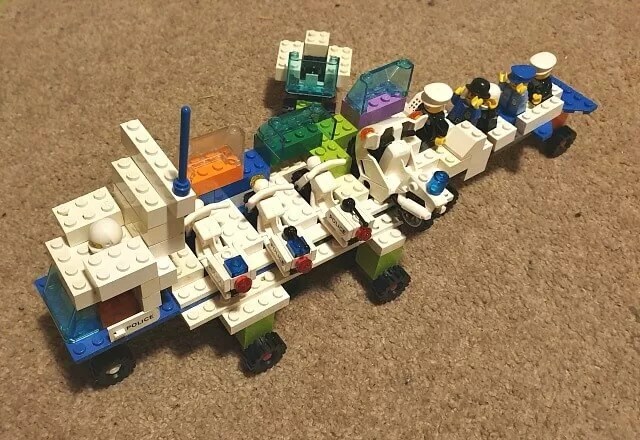 That is a cute and wonderful Lego creation. I love N’s Lego! Well done to him on being learner of the week. That is interesting to read how they teach breast stroke. I certainly wasn’t taught like that and I don’t think my kids were either! To be honest, their swimming teaching was pretty shoddy and we spent far more years than I care to remember watching them gradually plod through the levels. I think the boys were at one level for something ridiculous like four or five terms. It might have even been six! Level 2 here is always the killer. Most are in it for a year. Sometimes it does drag on but I love watching it. So much faster progress than with tennis! well done to learner of the week, a massive achievement. It is difficult to drag yourself out in the cold and wet let alone drag a child with you as well. Parking is a massive problem every where these days especially when people will use free parking and walk to work. Our parking wasn’t an issue when we were in 2 old buildings – 45 spaces between, plus there was plenty of on road parking. Then moved office, and down to 25 spaces, but middle of town so not really any on street parking nearby. We get allocation of 11 spaces a month, but you have to fight to get them on the days you want. There were space spaces the whole building could use, but now they are reduced. So we’re going to have to pay for the council car park now. Very contentious issue. It is so hard to find the enthusiasm to go out when it’s cold on a weekend. Well done to N for getting learner of the week! It sounds like he’s doing really well at school. That is a fab Lego creation. When he doesn’t get distractd, he does ok. I hate going out in the cold, but it’s just harder because swimming is Sat late mornings, and tennis tends to be early to mid afternoon. Means there’s not enought time to go to places. Big well done to N for being the Learner of the Week. The safety sessions might be boring but necessary. I don’t know if they had the same sessions in Ed’s school. What a pain with the parking. It must be so stressful. The Lego construction is creative. I love it when Eddie is freelancing with his Lego sets. I think last week was internet safety week, so they had both internal talks and external people come in. They’re pretty hot on it in N’s school.